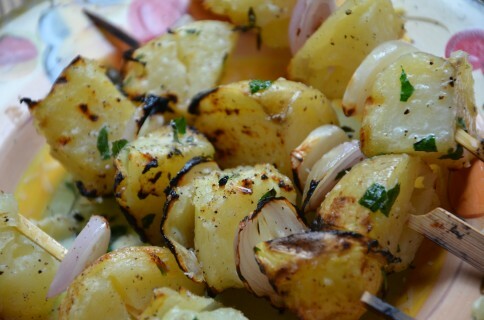 These grilled potatoes go great with corn on the cob and your choice of grilled meat. Use whatever herbs you have on hand (my favorite combo is thyme and parsley) and don’t forget the butter! Wash and dry the potatoes. Cut into 1 inch cubes and place in boiling water over high heat. Let cook until almost fork tender (but not fully done). Drain and set aside to cool slightly. Mince garlic and chop up herbs. Melt butter in a small dish and add the garlic and herbs. Add the butter mixture to the potatoes and coat. Add salt and pepper to taste. Thread the potatoes onto the skewers. Intertwine extra garlic slices and shallots if you like (as shown in photo). 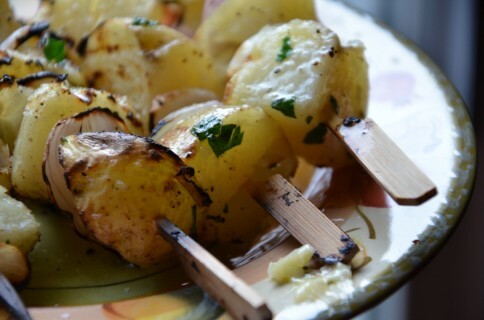 Place potato skewers on the grill over hot coals. Monitor the potatoes and flip once charred (roughly 3 minutes). After 5-7 minutes, remove from grill and let them cool for 1-2 minutes before serving.